Arjen Robben's left-footed strike after 12 minutes topped an impressive display as Premiership champions Chelsea beat a strong Milan side in Boston. Eidur Gudjohnsen had a goal ruled out for offside while Frank Lampard and Didier Drogba also went close. 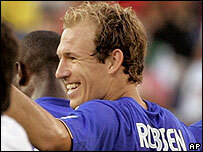 Clarence Seedorf had the best chance for Milan, who had Rino Gattuso sent off late on for upending Joe Cole. Chelsea lost their way after a rash of substitutions but Shaun Wright-Phillips came on to make a promising debut. The £21m signing was one of eight changes at the interval, which also saw the arrival of Asier del Horno, who replaced Geremi. Hernan Crespo, who was loaned out to Milan last season, played the first half for Chelsea, the Argentine combining well with Robben to set up Lampard, who could not keep his shot down. Wright-Phillips almost made a dream start when set up by Carlton Cole's enterprising run but the England international screwed his shot wide. As the game wore on, Chelsea sat back on their lead, allowing Milan more chances, but the Blues were still worthy winners. The teams will meet again next Tuesday in New Jersey.